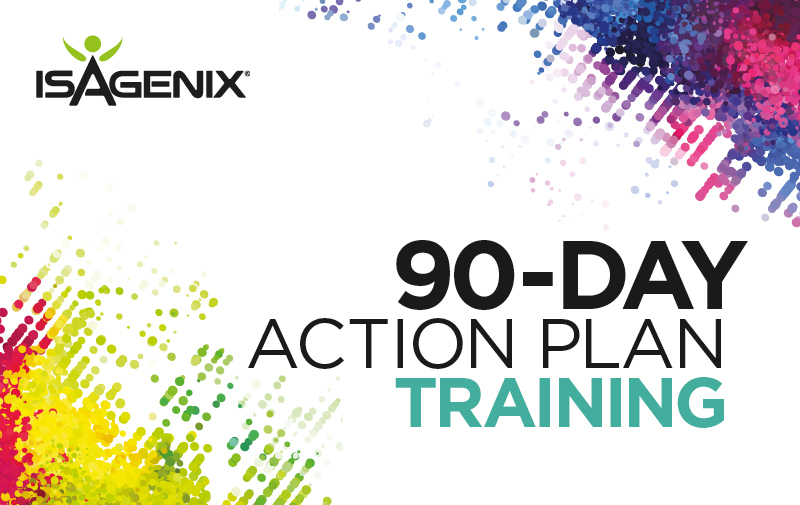 The 90-Day Action Plan is your business-building strategy for setting measurable goals and reaching them within a set period. It’s specifically designed to provide you with solid tracks to run on that will carry you through to success. Use it to build your knowledge, share your goals and celebrate your progress with your team, friends and family. We have some excellent trainers lined up to guide you through the 90-Day Action Plan during our Monday evening Zoom calls. This Monday, Brett Davis and Sammie Gascoigne kicked off a new 90-Day Action Plan by discussing how network marketing and Isagenix helps people to create and reach their visions. They explained how important it was to be mentally invested in your personalised goals, and how to create a direct route to reach them. With over 20 years’ experience in management and business development and 15 years in the anti-ageing industry, Helen brings a passion for helping others grow their businesses with Isagenix. Two years ago, she was able to help her husband retire through her work building her Isagenix business. Helen considers herself a citizen of the world, having lived and worked in over eight countries and travelled to many more. Topic: Define your ‘why’ & create your contact list One of the first steps of the 90-Day AP is to get crystal clear on ‘WHY’ you’re building this business. From there, you can create your vision for what you want to accomplish and how to set your goals. After this it’s time to look at your contact list and get your business off of the ground. Learn how you best develop a list of friends, business contacts and others who may be interested in the life-changing solutions Isagenix offer. After four years in the Network Marketing industry Emma Poli found Isagenix in January 2017 and joined in the pre-launch stages. Emma got to work straight away, and on Day 4 of the UK Market opening she hit the position of 4- Stay Crystal Executive. Since then she’s won 4 awards: shooting Star, 2nd Top Enroller, 3rd Top income Earner and 4th Place In creating consultants, as well as achieving enough in business to win two IsaRally trips. Topic: Connecting Every person you meet presents an opportunity for you to share an Isagenix Solution that could make a difference to his or her life. If you build good social connections, the opportunity to share Isagenix will happen naturally. The goal is to build friendships where you are genuinely interested in people’s lives and finding out how to help them. Ian has been actively involved in network marketing since 2012. He has supported different business building teams through his own business training programmes and has also helped new network marketing companies design their business models and compensation plans. Ian and Sue, together joined Isagenix in May 2017 when the company launched in the UK. They quickly became Crystal Executives and members of the UK Founders Club. They both share the Isagenix global corporate vision and are equally as passionate about the roll out of Isagenix across Europe. Ian and Sue moved to Spain in 2016 and travel extensively, building their business with only their iPhones! Topic: Following Up Following up is one of the most important income producing activities. When you’re sharing Isagenix, you’re bound to receive questions and objections. A very effective way to address these is by listening and showing new team members that you understand. Stacey has had over 18 years in the fitness industry working as a pilates instructor, personal trainer and spin instructor. Since being introduced to Isagenix nearly 4 years ago in Australia, Stacey has been able to step back from her career and work on her Isagenix business full time. Stacy has and moved back to her home town in the UK with her husband and is currently working on building her teams. Stacey says that she has found her true passion through Isagenix, transforming lifestyles and serving others “is what I was put on this earth to do”. Topic: Launch Parties & Presenting Isagenix As you build passion for the products, you’ll want to share them with the people that you know. There are different ways to present not only, the products but also the Isagenix opportunity. Launch parties can be a great way of connecting to your potential customers. Even if the initial introduction has been made, this is your chance to present just how great the product is from your very own home. How to access: Simply create a free Zoom account, then follow this link. International numbers can be found here. You can also dial in using the following phone numbers: +1 646 558 8656 (US Toll) or +1 408 638 0968 (US Toll). Please note: these Zoom details will be the same for each weekly 90-Day Action Plan Zoom call. You can download and import the following iCalendar files to your calendar system by clicking here. Also please note that the time is 8pm GMT.